When Did This Legend Start? Who knows? The earliest instance of it in any form, which I personally can find, dates from 2001 and is found on Usenet, where it was immediately called into question by another poster, Roger Pearse. As for the Nag Hammadi, Carbon 14 dates them from the 5th, so they are not a modern fraud. Have they been carbon dated? I am surprised, I must say – do you have a source for this? (That’s a genuine question). 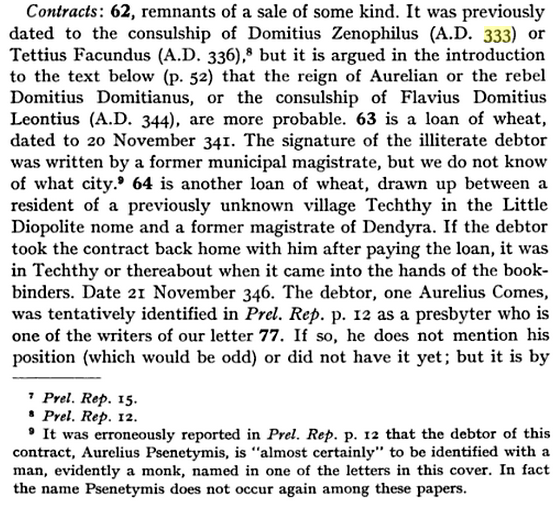 The paleography should establish their date anyway. This early “fifth century” form of the legend does not recur much, if at all, but in 2006, we find another spotting of the claim of “carbon dating of the Nag Hammadi literature,” although without any specific date, and it is to be quite significant for the development of this urban legend. The first step is simply to ask the question “is it an inference that christians existed prior to the fourth century”? in an earlier thread. What evidence to we have to prove this, etc? Hi Mountainman. Not sure what you are using as a working definition of “Christian”. Are the Nag Hammadi finds within the scope of that definition, for example? AFAIK the carbon dating of the Nag Hammadi literature which is purported to be relevant to the “New and Strange Testament”, is to a period after the Council of Nicaean (325 CE). 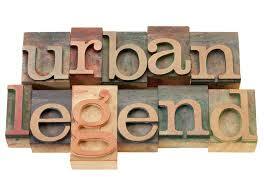 This is the oldest dated sighting of the “fourth century” form (AKA the “mountainman” form) of the legend. Notice that in the oldest sighting, there is no particular date given. Nor is this advanced by P. R. F. Brown himself as a consideration; it is used in reply to another person, who challenges P. R. F. Brown by mentioning the “Nag Hammadi finds.” Nothing more specific than “after the Council of Nicaean (325 CE)” is said here. The legend was soon to take on more particular shape. The Nag Hammadi finds have, for example, third century texts. Since the Nag Hammadi finds are carbon dated c.360 CE, and this date is after Nicaea, while we may infer such texts are earlier according to the mainstream theory of history, we may also not make this inference. 1) Nag Hammadi – dated by the bindings to c.360 CE (and I dont have any error bars for this one). Actually I am not sure Nag Hammadi has been carbon dated, and if it has which codexs. Notice the amount of uncertainty above (“there appears to be” and “these appear to be”). The next day, this claim is repeated in the same thread with slightly more detail but still with some uncertainty. The citation I had earlier sourced for the gThomas was a carbon dating citation on the binding of the spine of the book, which returned 350 CE. I am not certain it was independent of the Nag Hammadi find, or part of it. 2) LOCATION, c.280 CE (+/- 60 years), (gJudas). The carbon dating citation (360 CE) for the binding of a ms of the gThomas is one of only two known C14 citations related to NT literature. I am interested to determine whether there are any other carbon dating citations to new testament texts other than the above two. Thanks for any information. The reference to “materials” (interpreted as physical materials by Brown and thus supporting his belief in a C-14 dating), “bindings,” “padding,” and dating sufficed. For Brown, this was a citation regarding the C-14 dating of the bindings of a codex of the Nag Hammadi Library. Brown would go on believing this (and repeating this) for several years. This myth would prove to be of great importance to Brown, and it became one of the cornerstones of his idiosyncratic project to re-date large swaths of early Christian literature, including the texts found at Nag Hammadi, after the Council of Nicaea in 325 CE. The Gospel of Thomas, appearing as the second story within the second codex (NHC 2.2), within the Nag Hammadi Codices discovery, was reportedly radiocarbon dated to 348 CE plus or minus 60 years. There may indeed be some merit to the discussion of the Gospel of Judas manuscript and of Codex Tchacos, to which it belongs. A lot of the issues raised hinge on the difference between uncalibrated C-14 results and calibrated C-14 results, which ones have actually been published regarding the Gospel of Judas, how they should be interpreted, and how one should go from the uncalibrated to the calibrated results in the case of the Gospel of Judas, all of which is best left for another time. 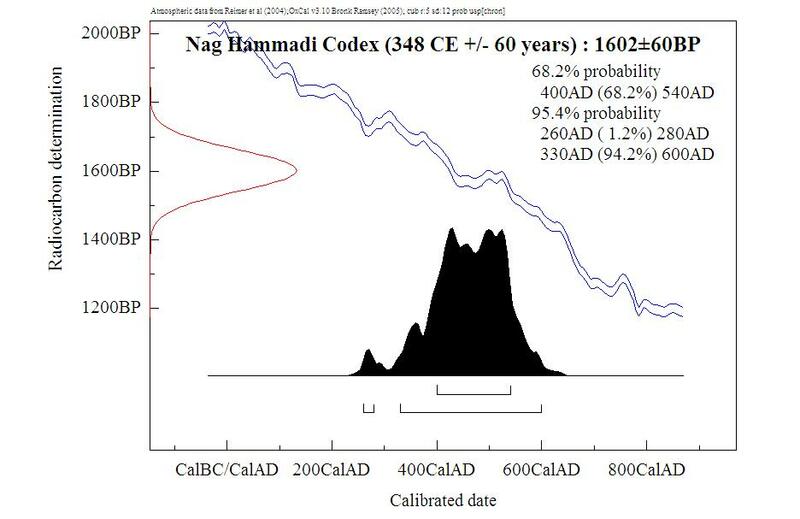 Brown, with the help of a few friends, can even show us charts with the calibrated dates of the C-14 radiometric dating of the material in the Nag Hammadi codex (because–and I know not how–he has concluded that the supposed C-14 dating of the Nag Hammadi codex material was in fact uncalibrated and therefore needed to be calibrated by him), complete with some very specific numbers. By 2012, P. R. F. Brown had come to realize the likelihood that he had made an error (perhaps on his own, or perhaps with someone else pointing it out to him). Yet he let the presentation with its misinformation remain on his website, unchanged, for another three years. Everything I’ve read was that only two MSS were carbon-dated, the gospel of Judas and one of the Nag Hammadi codices; but the canonical gospels and other NT documents were only dated paleographically. There is a question as to whether the Nag Hammadi Codices have been C14 dated. In articles that I have authored I have stated that the NHC have been C14 dated to 348 CE plus or minus 60 years. This may be an error on my part after a very hasty reading and notes on R Lane Fox’s “Pagans and Christians”. There is no doubt that the NHC are dated by various OTHER methods, such as analysis of cartonage, to the mid 4th century. So the date stands quite firm. However it is not, as far as I have been able to be determined, representative of C14 testing, which is strange, since C14 dating technology has been around for some time. There are only 2 C14 dating tests that I know of in this category – ie: Christian manuscripts. There are quite a number of issues being raised here. But perhaps the greatest is that these people are using an Ante Nicene chronology which has been defined by the heresiologists. Nobody is thinking laterally and asking the obvious questions even when the Nag Hammadi Codices – the biggest single manuscript discovery in this area – are dated more than two decades after the establishment of the Christian State. All their supposed problems would be cast into a new light if they momentarily considered the texts of the NHC and the so-called “Christian Gnostics” as Post Nicene authors who are reacting to the political nature of the Constantine Bible. All the physical codices were manufactured c.348 CE. While the C-14 aspect of it has been shed in most recent communications from P. R. F. Brown on the subject, it remains part of the erroneous website presentation, as of March 2015. The Impact of the Myth? It also allows scientists to date ancient manuscripts like the Nag Hammadi Library, the Dead Sea Scrolls, the Gnostic gospels, etc. Which is half-right, of course, and completely right if you lean on the meaning of the word “allows.” Codex Tchacos, with the Gospel of Judas, has been subjected to C-14 tests. So have the Dead Sea Scrolls. The phrasing, however, suggests familiarity with Brown’s webpage. So… Is It a Myth? My sources say yes. I have done some searching high and low through reputable, peer-reviewed sources. This includes searches of Jstor, Google Books, Google Scholar, and my own Biblical Criticism & History custom search engine, using a variety of terms along with “Nag Hammadi” such as “C-14,” “C14,” “carbon,” “radiocarbon,” “radiometric,” etc. The result is that nothing shows up in these search engines. Moreover, there are some actual references regarding the dating of the Nag Hammadi codices that can be found in the literature, and they speak of other criteria for dating entirely. How Did This Carry On So Long? The “mountainman” form of the myth had some legs, as its originator was able to propagate this myth for several years, without coming to realize his own error and without very serious opposition to the claim. How did this happen? The answer, in part, may lie with the fact that the myth was partially consistent with reality. The Nag Hammadi codices are typically dated to the fourth century. Without raising any very obvious red flags and without promoting a conclusion to which many would object (a fourth century date for the Nag Hammadi codices), the myth went largely undetected. There was some pushback at first, but apparently the repetition of the legend, along with increasing amounts of detail and certainty expressed, helped the myth to survive so long. For a moment, I almost believed it, in the conversations taking place on the Biblical Criticism & History forum. However, I did not take years to figure out that it was completely false. I didn’t find out by looking at the internal inconsistency, although there is one, in some forms of the myth, i.e., the ones that hew closely to the supposed citation in Fox’s book. Carbon dating results, when expressed in a single number, give an average across a large range of possible dates; a carbon dating result is not given to a specific date or after a specific date. No, I saw it when looking at the peculiarity of that very particular number: 348. And this is perfectly accurate when “materials” is not understood physically but lexically, as the contents of the writing on the fragments used to stuff the codex binding. And that codex is Codex VII. Here is Nag Hammadi Codex VII, ed. Pearson and Wisse, p. 1. As an aside: Thus, reading the footnote referencing Turner quite woodenly, Codex VII would be dated, on just the basis of the fragments in the binding alone, between 348 CE and 541 CE (given that a time lapse anywhere between three weeks and two hundred years is known to occur). Figuring out the median of the probability distribution of its dating is complex, given the presence of three (or four, as we will see) fragments, but simple arithmetic might show that it would lie between 366 CE and 373 CE (adding 25 years to 341 CE and 348 CE, respectively), if not slightly older (given that the 25 years figure above is an average and not a median). Adding any other factors into consideration in dating this codex (other than these dated papyri) would add yet more complexity. But this is just the date for Codex VII specifically, not for all the Nag Hammadi codices, which must not be simply assumed to have been produced in the very same year or even the very same decade. There is apparently some minor controversy regarding a fourth dated fragment, also from Codex VII. Some regard it as being dated to 333 CE, while others would read it instead as dating to 344 CE. 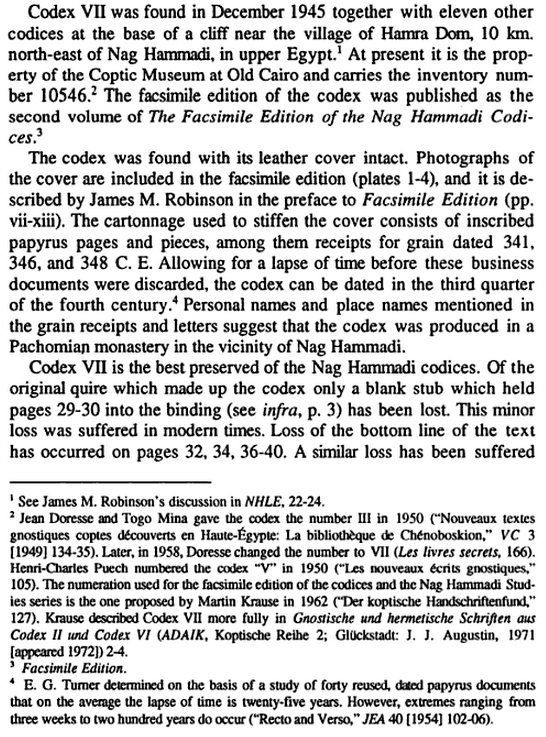 A reference to this scholarly disagreement can be found in the review, written by W. J. Tait, of the book Nag Hammadi Codices: Greek and Coptic Papyri from the Cartonnage of the Covers, found in The Journal of Egyptian Archaeology (Vol. 74, pp. 299-301) in 1988. 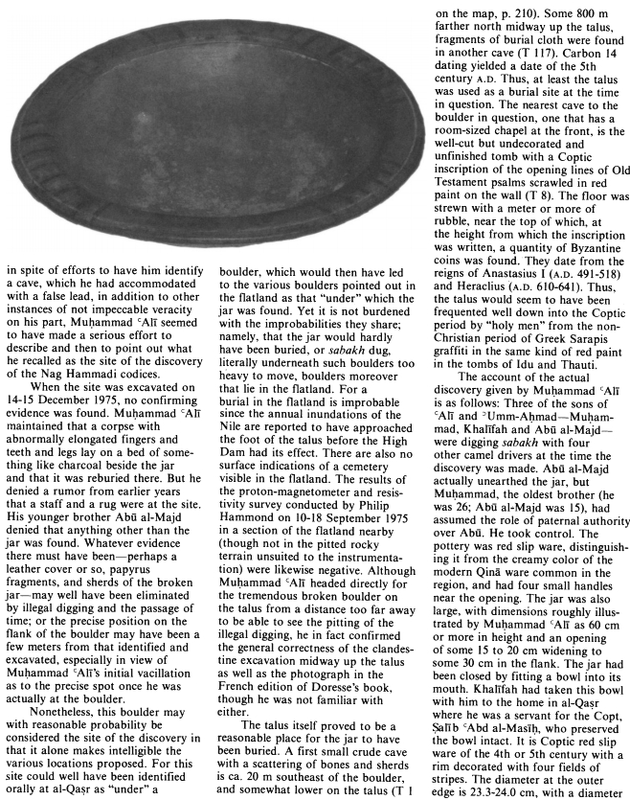 There are at least some other discussions of the fragments found with the codices: Rethinking the Origins of the Nag Hammadi Library, Monasticism and Gnosis in Egypt, Gnostic Proclivities in the Greek Life of Pachomius and the Sitz im Leben of the Nag Hammadi Library, an article from Edwin M. Yamauchi (p. 428), Essays on the Nag Hammadi Texts: In Honour of Pahor Labib, Les textes de Nag Hammadi, The Facsimile Edition of the Nag Hammadi Codices Volume 15, and some book reviews, including the one above from W. J. Tait, from Robert Haardt, again from Robert Haardt, and from Bentley Layton. Not yet, not for the Nag Hammadi codices. Nobody knows what the future might hold, of course. While it is not directly relevant, there is a reference found in the very interesting essay from Nicola Denzey Lewis to something from the general vicinity of Nag Hammadi, at least, among the cemetaries at Gebel el-Tarif, that has been dated with a C-14 radiometric dating test (p. 410). Perhaps other, new myths will arise out of other, newly-misinterpreted references? Time will tell.